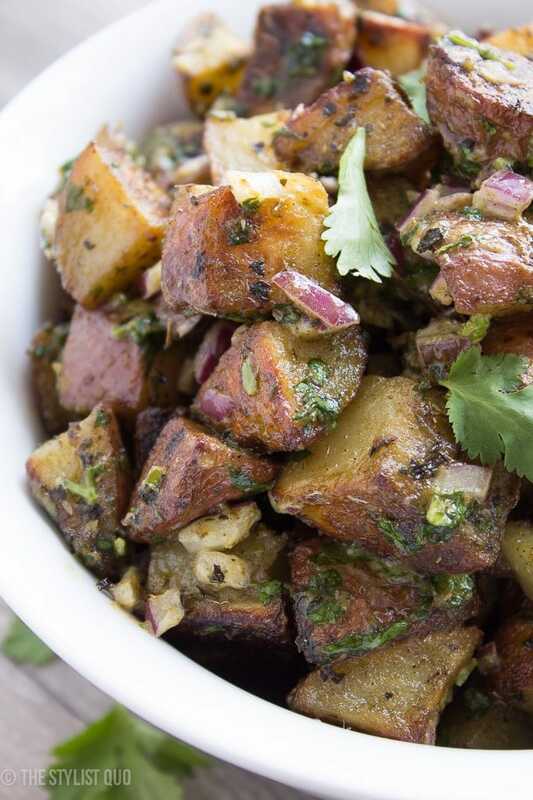 This herb roasted potato salad is absolutely delicious: crispy roasted potatoes, heady dried herbs, and a rich and creamy sauce with fresh herbs and minced red onions. Packed full of flavor, this herb roasted potato salad is destined to become a favorite, both with the family and with your guests! 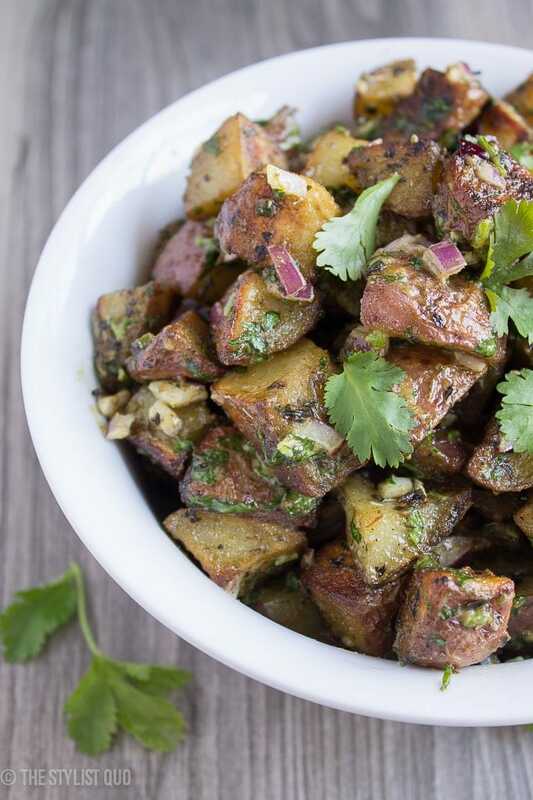 This herb roasted potato salad is also paleo, Whole30-compliant, and vegan friendly. 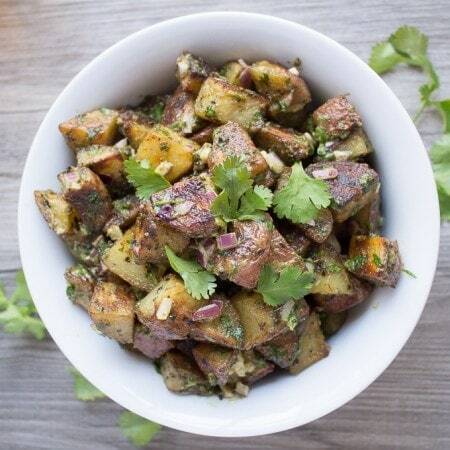 Simply put, it’s the best herb roasted potato salad out there. Have you guys had a little burst of spring yet? Yesterday in Memphis it topped out at over 70 degrees, and today it’s hardly 50.. but last week, the kids were out from school Monday through Wednesday. Snow days! Crazy, am I right? But now that there’s even the slightest hint of summery relief in sight, I’m already craving margaritas, portobello burgers, and elote. The hint of a crisp breeze in the summer, and I’m reaching desperately for the pumpkin spice; the reverse is also true. Greener grass syndrome, I suppose, but at least it’s delicious. This herb roasted potato salad totally, 100% counts. Mayonnaisey cubes of overcooked potatoes has never been my thing; in fact, I used to think I just didn’t like potato salad. That is, until I tried an herb roasted potato salad.. after which I was convinced potato salad might just be my favorite food, ever. 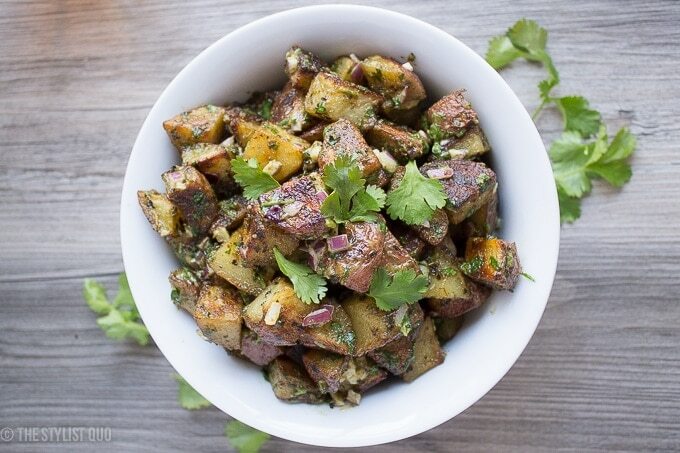 Deep, yet fresh and flavorful from the herbs, a bit of bite from the red onions, and still rich from a bit of mayo stirred into the warm potatoes right out of the oven–without being gloppy or even really obviously “creamy”, this is guaranteed to be the next dish you become famous in your little group of friends and family for. I made a huge batch for our engagement party, at O’s request–it’s his favorite, too–and it was one of the first things gone. Completely cleaned out, and I’m pretty sure I even saw someone licking the bowl.. Being a gourmet step up from the yellow picnicky side, it goes well with pretty much everything, and especially a spring or summery culinary escapade, like that burger or a nice ribeye. For the vegans among us (hi! I’m one of you), the herbed roasted potato salad pairs beautifully with a grilled portobello cap, drizzled with a bit of chimichurri. Nom..
Trust me on this. Make this ASAP. This herb roasted potato salad is the perfect spring and summer potato salad: packed with flavor, a bit crispy, and definitely rich. Pairs beautifully with burgers and picnic-worthy food. Preheat the oven to 375º. Toss the bite-sized potatoes in the oil until coated well. Mix together your spices in a separate bowl. Add the spices, about 1/4 of the mixture at a time, until coated liberally (you may not use ALL the spices, but you do want the potatoes to be pretty dern covered). Roast for 30 minutes then flip with a spatula. Roast another 15-20 minutes, or until beautifully golden brown and crispy. As long as you don't <i>burn</i> the potatoes, you'll be good. Remove from the oven and scrape potatoes into a large heatproof bowl. Let cool for about 3-5 minutes or until they're no longer <i>hot</i> but very, very warm. Meanwhile, mix together the mayo, cilantro, and red onions. Scrape this mixture into the potatoes once you've allowed them to cool briefly and fold until coated in the mayonnaise-herb mixture. Serve warm or at room temperature, but not cold. Tada! Mmmmm. I love this. I swear I’ve never seen anything like this. I love roasted potatoes. Add some cilantro and mayo to that, and I don’t think you can go wrong. I bet this is going to be my new favorite thing!